One of the best issues of this run so far, Rocha and Henriques’ art compliments Orlando’s story perfectly in Supergirl 12. The issue picks up from the very surprising conclusion to the previous issue, and provides a satisfying “out.” Though really, Supergirl needs to learn to be more observant. There is some great dialogue for Cat Grant, a character who really requires strong lines, and some more development as Kara tries to maintain her secret identity. But the reason readers will be picking up this issue is the return of the Emerald Empress, and a new Fatal Five to back her up. I normally do my best to avoid revealing anything that might be a spoiler, but in this case I think the issue merits a listing of just who these villains are. It’s an interesting assemblage, culled from a variety of sources. Magog, of which their have been a few varieties since Kingdom Come, is introduced with yet another new backstory. Solomon Grundy is part of the team, although the story makes it clear that this is not the “real” Grundy, but a clone grown from a strand of the original’s hair. Indigo was once a member of the Outsiders, and then revealed as a villain, fighting that team and the Teen Titans. More recently a version of the character appeared on the Supergirl tv series, which seems to justify her inclusion on the team. The last member is a witch named Selena. This is a new character, although one can safely guess that her inspiration was the witch of the same name portrayed by Faye Dunaway in the Supergirl film from the 80s. The characters do not resemble the classic line up of the Fatal Five in terms of powers in any way, but I would wager this story is more interested in introducing these as potential recurring villains on their own for Supergirl. 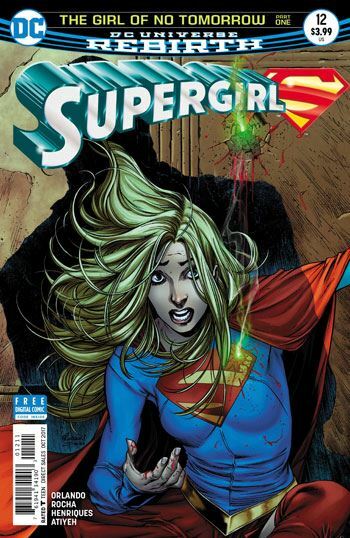 Most of the group don’t get much of an opportunity to do more than be introduced in this issue, and their fight with Supergirl only gets started as the issue comes to a close. But I didn't mind that. It's the usual structure for such tales. There is one very interesting revelation, that the Emerald Empress herself is being manipulated, having come back in time to kill Saturn Girl, but discovering that the visions she was given were a lie. Is this all tied to Rebirth? I’d certainly put money on that.